Roughly dice the celeriac and potatoes. Bring the veal stock to the boil and add the neck of veal to simmer. After half an hour, add the potatoes and the celeriac to the pan and simmer until cooked. Heat the olive oil in a non-stick frying pan and soften the onion, without browning. Then add the chorizo and fry this gently. Remove the neck of veal from the veal stock and keep it warm. Reduce the veal stock left in the pan down to 2 decilitres and season with salt and pepper. Purée the pieces of potato and celeriac, then mix with the finely chopped celery leaves, olive oil, onion, chorizo, crème fraîche and butter and season with salt and pepper. 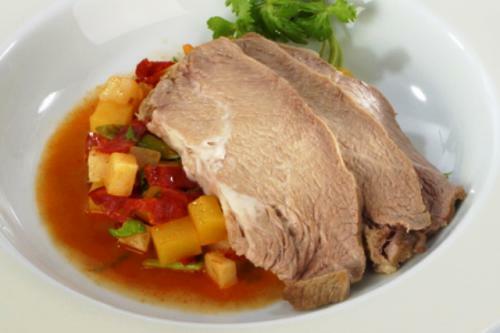 Using a sharp knife, cut the neck of veal into slices 1 centimetre thick, place them on the potato-and-celeriac mash and serve the veal gravy separately. Serve with a good glass of beer.